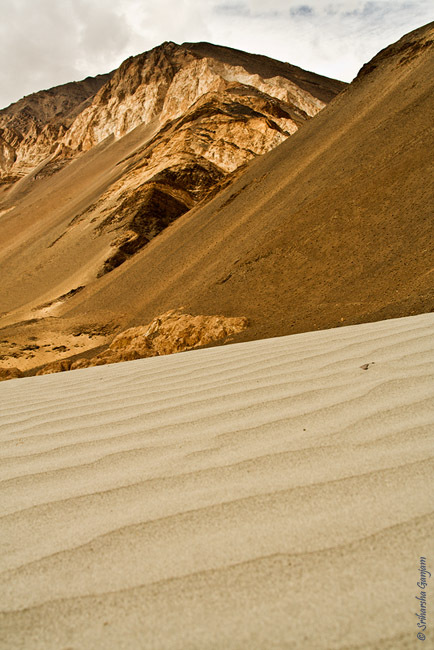 Below are two images I made in Ladakh last year. 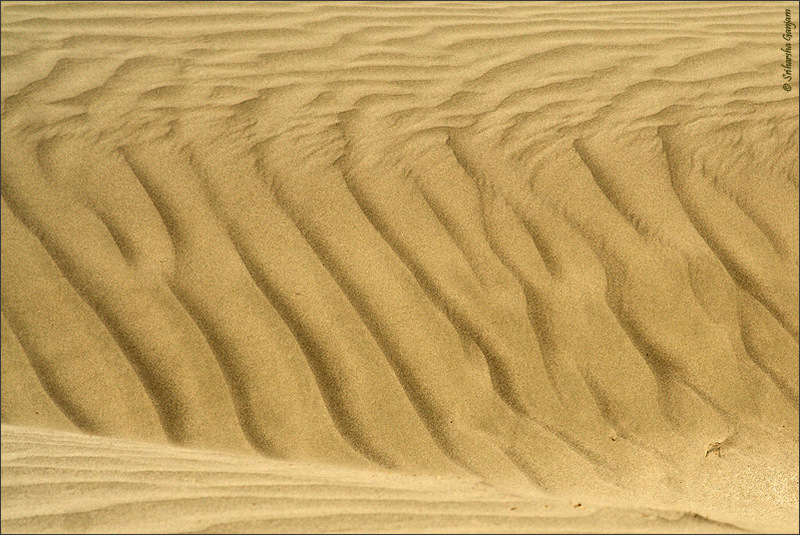 These were some really interesting sand dunes we came across on our way back from Pangong to Leh and what caught my eyes, were the lovely intricate wave patterns on the soft dunes. The minute I saw it, I knew I wanted to make an image of the patterns. Before you read on I want you to have a look at both the images and decide on which image looks more “inviting” and “interesting” to the eyes. Ok now that you have made your choice, you can read on. An image looks more “inviting” and “interesting” only when it lets the eye “wander” and “explore”. This is actually a very important aspect that one should keep in mind when photographing patterns. The patterns in the image must be aligned such that they allow for free movement around the image. Now how to achieve that? If you look at the two images above, you will notice that the first one has the wave patterns framed perpendicular to the line of sight and the second one has the waves almost parallel to the line of sight. Now if this theory is any valid, then most of you would have chosen the second image, with the waves running parallel to the line of sight. Why is this? The theory goes that when your eyes hit any pattern the mind always prefers to glide through the patterns rather than jump across it. This is easy to understand if we imaging water flowing on the pattern. If the given a chance the water will always flow along the direction of the patterns than across it. That’s the same reason why our minds like images which has patterns running parallel to the line of sight compared to images which has patterns running perpendicular to it. This learning can also be applied when making landcape images which have lines running through the frame. It’s always better if you can have the lines or patterns running into or outside the frame, than running across it. 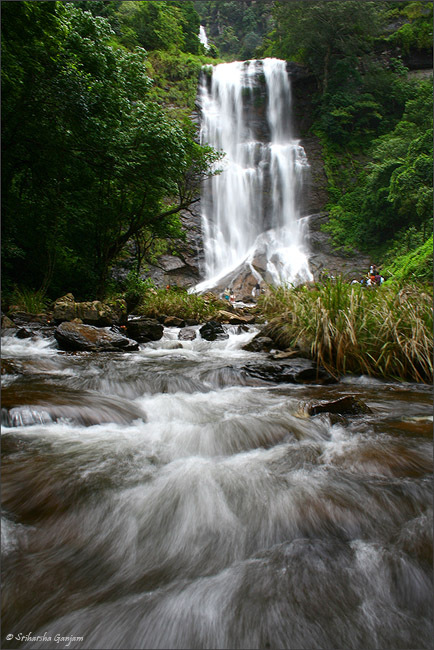 This waterfall in Kemmangundi for example has line patterns in the water flow, and I aligned myself such that the lines moved in a direction out of the frame keeping the above theory in mind, thereby encouraging the viewer to explore the picture. So the next time you making images keep this thing in mind, by looking for patterns and aligning yourself right for achieving the perfect picture. Hope I have confused you enough for the time being, and as always we at LW look forward to hearing from you. I selected the first image when I was asked to do so. The reason for me to do that was the composition of the image. Rocky and green mountain at the background and sand dunes in the foreground. I liked it because, the two orthogonal concepts are photographed together. But, Article however speaks more about line of sight and the pattern of dunes. I could get some clarity only when I held my hands to cover the mountain from my view in the first image to compare the two images. So, Probably you can crop the image so that the mountain is not visible to make it more appropriate to the context. Just a thought. That Hebbe Falls image is amazing! awesome composition. I went to the falls in peak monsoon and I contemplated going to the middle of the stream but decided against it. Looks like i should have after all!